Paradise fish make a great choice for the unheated indoor aquarium, says Jeremy Gay. Diet: Flake, frozen and live foods. Good at eating snails. Water: A very hardy fish, living perfectly well in hard or soft water, pH 6-8, and warm or cool water, temperature 16-30°C/60-86°F. Perfect for the unheated indoor aquarium, though it would not survive a British winter outside. Notes: Known as possibly the first “tropical” fish to be kept in aquaria, this can actually be put down to the fact that this fish will happily tolerate cooler water and low oxygen levels, as it is an air breather. These survival tactics would have led to success with the species by early aquarium keepers, whereas other tropical species would have quickly died. It enjoys a mixed reputation in the hobby as although it is known for being a good snail destroyer and a pretty, cool water alternative to goldfish, it can be pugnacious, attacking small fancy goldfish and sometimes fighting with each other. 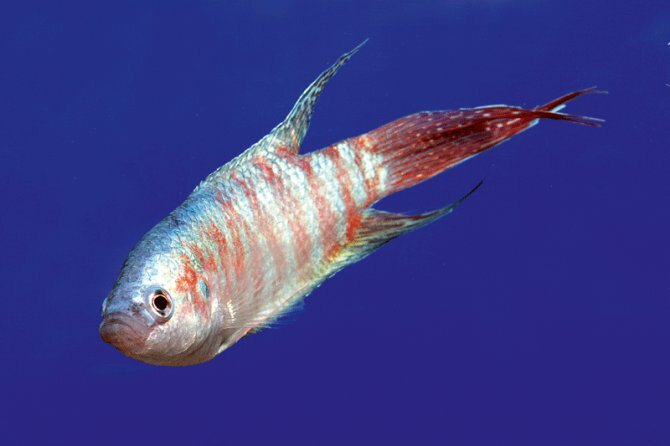 The key is to keep the species on its own or mixed with other temperates including Rosy barbs, Danios and Flagfish. A trio of two females and one male may result in the females fighting, so a nice mature, sexed pair is best and when temperatures rise they will breed, by way of the male constructing a floating bubble nest. Don’t keep two single males together as they will fight. Aquarium: A single specimen can be kept in an aquarium of 45-60cm/18-24” length, though a pair will need larger and they will look and behave at their best in a large, cool water planted aquarium. Floating plants are essential for bubble nesting, along with an area of calm water. Again, don’t add one to an existing goldfish aquarium as they should not be mixed. Sexing: Males are larger, more colourful and with longer fins. Females become fuller bodied, with eggs, and more dull in colour. Identification: There are other Paradise fish in the tropical hobby, though you won’t get them mixed up, and they will be much less commonly available, and less gaudy than the species mentioned here. There are a metallic blue colour variant and an albino form widely available too. Availability: Available the world over, from small pet shops to aquatics specialists. Easy to get hold of. Legal position: Officially classed as a tropical fish, Paradise fish are not affected by coldwater, non-native fish licensing, so importers, retailers or hobbyists do not have to apply for any special permits. Price: £2-5, depending on size, variety and quality. This article was first published in the November 2009 issue of Practical Fishkeeping magazine. It may not be reproduced without written permission.